UFC 207 was set to be Ultimate Fighting Championship’s (UFC) year-end blowout, featuring the highly-anticipated return of former women’s Bantamweight champion Ronda Rousey taking on current champ, Amanda Nunes. And let’s not forget the “other” 135-pound title fight between Dominick Cruz and Cody Garbrandt. While all four combatants are expected to spearhead the pay-per-view (PPV) event this Friday night (Dec. 30, 2016) in Las Vegas, Nevada, today’s media day festivities were rather lackluster, as all four key players were absent from the action. Of course, it’s been well-documented that “Rowdy” negotiated a media blackout prior to announcing her return, but the fact that Garbrandt and Cruz were made unavailable for pre-fight staredowns is rather lame. 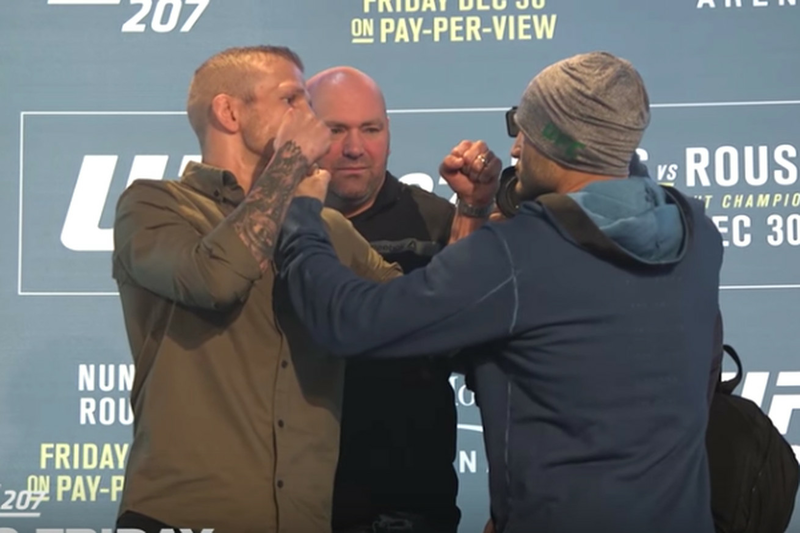 Nevertheless, T.J. Dillashaw, John Lineker, Neil Magny, Johny Hendricks and several others were on hand to field questions and pose for photographs, which you can see in the embedded video above. MMAmania.com will deliver LIVE round-by-round, blow-by-blow coverage of the entire UFC 207 fight card on fight night, starting with the Fight Pass “Prelims” match online, which is scheduled to begin at 7:30 p.m. ET, and then the remaining undercard balance on FOX Sports 1 at 8 p.m. ET, before the PPV main card start time at 10 p.m. ET. To check out the complete UFC 207: “Nunes vs. Rousey” fight card and line up click here.